The French author Guy de Maupassant (1850-1893) was a master of the short story, creating detailed character studies and brief but moving dramas well suited to the genre. The nine stories in this collection provide a vivid portrait gallery of his typical subjects — from simple peasants and prostitutes to soldiers, government clerks, and provincial bourgeois. Brilliantly naturalistic, these short works also reveal Maupassant's ability to observe the innumerable details of everyday life and reproduce them artfully and accurately, often with a caustic sense of humor. 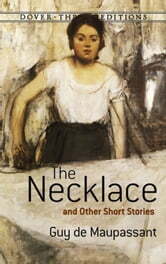 His literary talents are amply displayed in this volume, which includes these memorable tales: "Ball-of-Fat," regarded by many as technically one of the finest short stories ever written, "The Necklace," "A Piece of String," "Mme. Tellier's Establishment," "Mademoiselle Fifi," "Miss Harriet," "A Way to Wealth," "My Uncle Jules," and "The Horla."